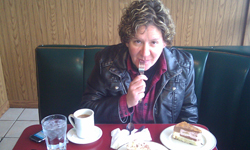 We arose from my favorite B&B in Dawson (5th Avenue B&B), ate breakfast, and hit the road. 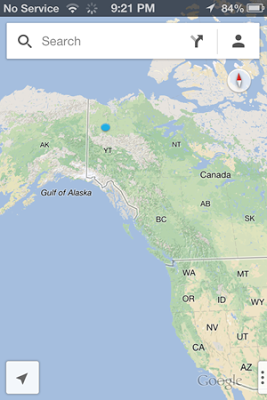 We had a long day in front of us – 257 miles. Now that doesn’t seem very long, but depending on road conditions, it can be very long. 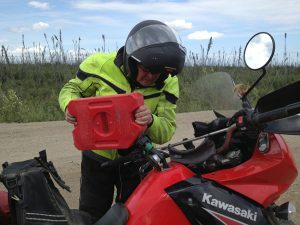 On a side note: We decided to top off our gas in Dawson, just in case the little Klondike Gas Station at the start of the Dempster was closed. Great call! The gas station is now boarded up and closed. If we had not filled up in Dawson, we may not have made it without running out of gas. We carry an extra gallon for each bike, but that is cutting it close. 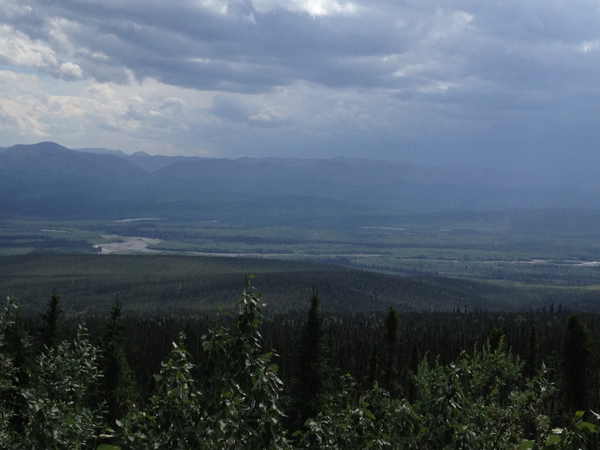 Along the road we have seen moose, foxes, marmots, and tons of rabbits and ptarmigans. 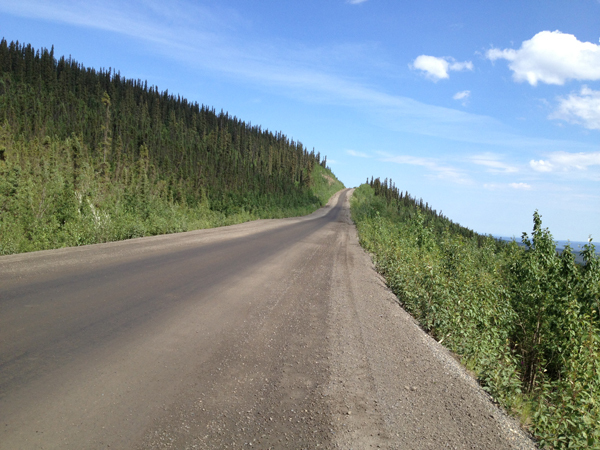 The Dempster Highway is a fairly young road, opening in 1979 to accommodate oil and gas development. 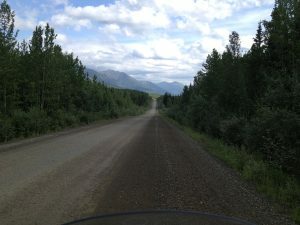 It is 457 miles of dirt road, which ranges from easy to almost impossible to travel, depending on rain. We were planning on riding to Eagle Plains, one of only two places you can stay along the way. We were not sure if we had a room. This place fills up early in the season, and although they were booked, they were going to try to honor our reservation from the night before. 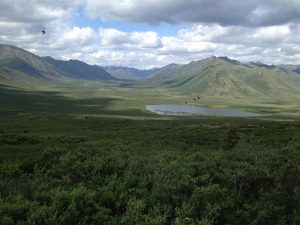 Getting stuck in Tok threw off all of our reservations by one day. We always carry a tent and sleeping bags in case we get stuck. 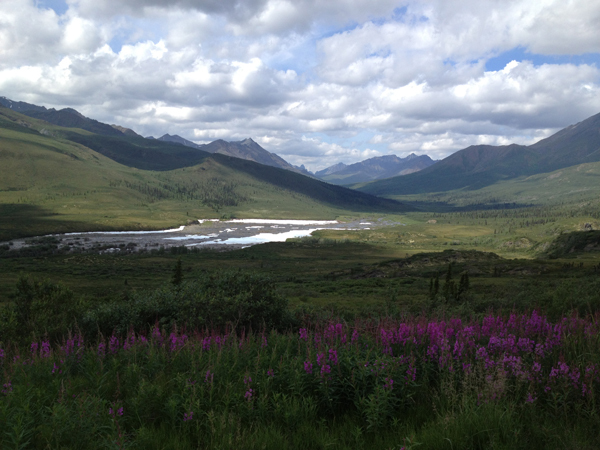 I think the prettiest part of the highway is Tombstone Park, near the beginning. If you ever make it out this way, make sure you take the time to visit this park. We put the GoPro on to film this section of the highway. It is absolutely amazing. 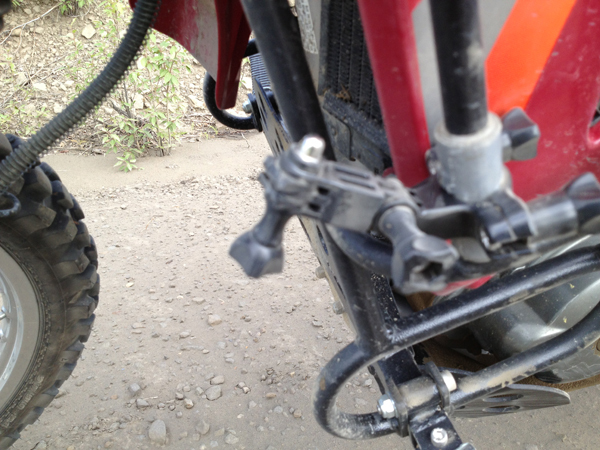 Unfortunately, the mount broke on the GoPro and we lost it. We have no idea where it went. The road travels broad valleys, alongside several braided rivers, very similar to Alaska. As you climb above the tree line, you can see for miles. Ravens fly over this valley. 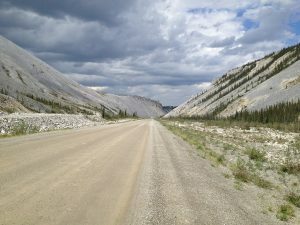 The road surface was mostly dry with large sections of gravel. I had one frightening encounter where I hit a deep patch of gravel at about 45 miles an hour and the bike jigged and jagged. It is moments like this that require you to be really focused while traveling this road. Rough patches will pop out at you quickly without much visual warning. I had a firm grip and rode it through. Michael said the nice thing about following instead of leading is that you can see best which places to avoid. Gravel gravel gravel… the road even had mountains that looked like they were made of gravel! The dust was bad; we were covered in white. The zippers on the gear started failing from all the dirt. Large supply trucks would pass and cause total white out conditions. 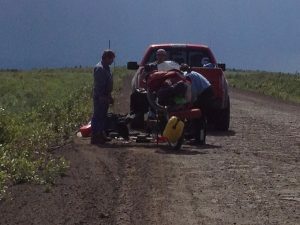 We came across one KLR with a flat tire. 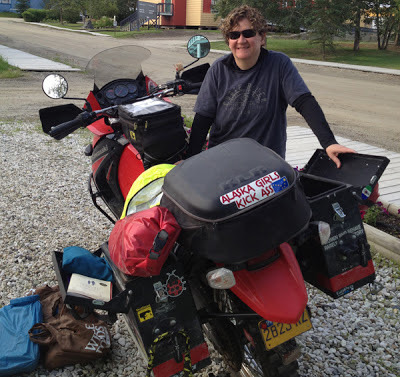 It looked like they had it handled so we pressed on, tired and dirty, hoping we had a room for the night. 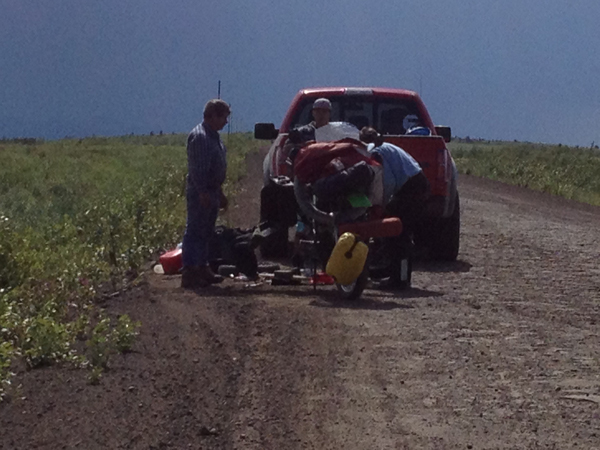 We stopped to top off our gas with our auxiliary gas tanks just outside Eagle Plains. The road got more rugged leaving Tombstone and heading into the wetlands. We slipped into Eagle Plains, and the gods were smiling on us. They had a room! Huck: I am totally spellbound! Your pictures are great. Stay safe.